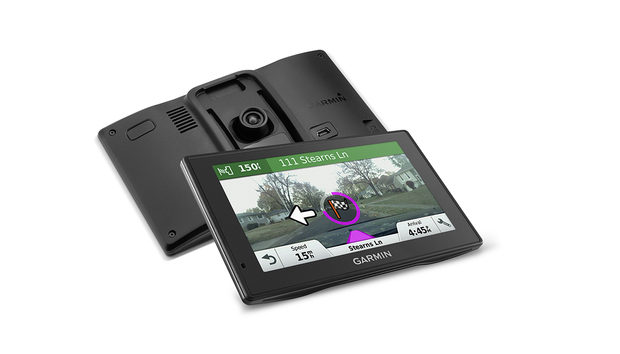 Garmin's DriveAssist 50LMT is really a navigation unit with camera thrown in. We’re judging it here it purely on the basis of its dash cam abilities, where it has one surprising limitation. Still, as a total package, it has broader appeal. As far as ease of use is concerned, the DriveAssist 50LMT is the standout product in the roundup. The large 5-inch, 480x272-pixel touchscreen makes both browsing the interface and configuring the camera a snap. As we’re here for the 1080p/30 fps/90-degree field-of-view camera, we won’t review the navigation features, but they are lifetime, top-notch, and include voice command. Daytime video from the DriveAssist 50 is top-notch, and it handles subtle light transitions very well. The DriveAssist 50LMT ships with a 4GB SDHC card in the single slot. There’s another SD card slot, but it’s for offline map data only. The unit is powered via an auxiliary power/mini-USB cable, but there’s a Li-ion battery that lets the unit run for a full 30 minute, so you could actually use it as a video camera. There’s support for a $170 backup/baby camera, but you can’t record from it. The DriveAssist 50’s night video was lacking in clarity. Other cameras managed much better video even in the rainy conditions. Alas, while the DriveAssist 50LMT’s daytime video proved very good, the night video was not. It’s grainy and prone to flare from headlights, which could obscure important detail in a nighttime incident. Note that its cousin, the Garmin Dash Cam 35, takes great night video, so this is a puzzling oversight in the DriveAssist 50LMT. We should also note that 90 degrees is a limited field of view, and won't capture side impacts as well as most other cameras, if at all. Take the night video from the Dash Cam 35, add another channel for recording from the rear cam, then marry them to the DriveAssist 50’s interface and display. Now that’s a dash cam we’d love to review.